It seems silly, these days, to think of myself as a spinner. Once upon a time, Stella the spinning wheel lived in a corner of our living room, and so I thought nothing of spending a few minutes with her each day. Now, though, with a preschooler in the house, things are different. Stella got demoted to the spare room as soon as Ian became mobile, because, as good a kid as he is, he can't help but want to play with the wheel. (And who can blame him? My great-aunt had a spinning wheel in her living room -- hers was just a pretty antique, rather than something that was actually functional -- and that thing was like a MAGNET. Even though I knew I wasn't supposed to touch it, I could never resist spinning the wheel as fast as it would go. What kid could?) I'm not really too worried about him breaking or damaging the wheel itself, but if I have a work-in-progress on it, I don't want him to mess it up. The problem is, though, I am very much an out-of-sight, out-of-mind kind of person, and Stella being stored away means that Stella is ignored. 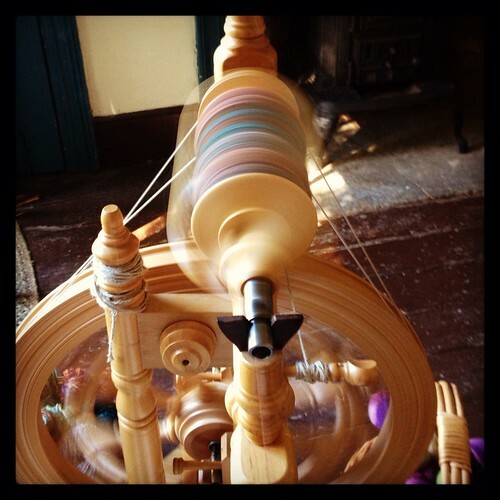 This summer, the Historical Society asked me if I'd do the spinning demo at our country fair again -- I've been doing it each year for about five years now -- and of course I agreed. All throughout July and August, not a day went by that I didn't think "I should really get out the wheel and practice..." but days turned into weeks, and then suddenly it was the weekend after Labor Day and the fair was imminent and I hadn't done a thing. I went into the spare room to dust Stella off -- literally and figuratively -- and realized that the bobbin of yarn on the wheel was the very same bobbin I spun LAST YEAR at the fair -- I hadn't touched the wheel at all, not even for one little project, for an entire calendar year. How embarrassing! That's when I started to worry that maybe the whole demo thing was a bad idea -- that I'd get there and just discover that I'd completely forgotten everything I once knew. I sent off a worried text to Tamara, who pep-talked me. "It's like riding a bicycle! ", she assured me. So on Sunday I packed up all of my stuff and hauled it off to the Historical Society. I got there a little early so I'd have plenty of time to set up my little room, and then I loaded a fresh bobbin on the wheel, drafted some fiber, took a deep breath, and started to treadle. And Tamara was right. It IS like riding a bicycle. Those colors are really, really pretty. And that bobbin is filling up!